I caught word from Hebrank that Pixie from L.A. Ink would be stopping by Identity Tattoo this week. I sent a bunch of shirts out to the guys at the shop back in the Fall and apparently Todd sent one of my ladies tops to Pixie, who is an old friend of his. 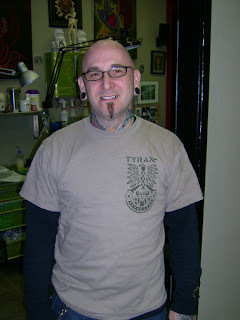 Anyway, long story short the guys at Identity sent a few photos my way of Pixie repping TYRANT. Very cool of them to shoot some photos and even cooler that she took the time to pose for them. Nice to see our little East Coast outfit getting a little love from a West Coast gal. Thanks guys, thanks Pixie! Much appreciated! Hebrank also put up a post on this topic, go check it out HERE. So T crashed pretty hard jumping the spine at the Haven Park last Thursday. After 3 days of being in agony she bit the bullet and went to the doctor for some x-rays. The results are due in today, there's a possibility T may have fractured her pelvis or coccyx (tailbone)....OUCH! Let's hope all is well and she's back on the bike soon! In honor of our new web address Shawn Hebrank created this bad a$$ new shirt. I'll be screening this week and shirts should be available on the TYRANT MySpace page February 1st. Look for me at the Haven Skatepark next week, I'll have the shirts with me for sale, only $10! Starting tonight at Midnight rideTYRANT.com will have some temporary links up. 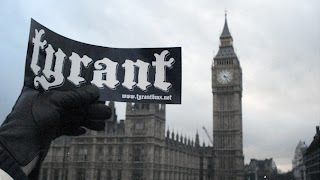 You'll be able to access "Photos" and "The TYRANT Blog" till the new site launches next month. Get on the site tomorrow and check out the rad photos taken at the Haven Skatepark over the course of the past few months!!! Thanks to Jason for getting the site in semi-working order! 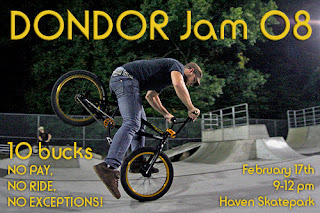 Arnwine and I headed down to Haven to ride the Tuesday night BMX session and it was dead, 9 riders! We had the whole park to ourselves and lots of rad stuff was going down. Tom Burke was going off, check out the photos at TYRANT's Photos. "Burke Did It First" - Huge Fuf 5 mins after Rick built the rail! You know him cause he's the Gentle Giant 6' 5" Lurch, you can't miss him!!! 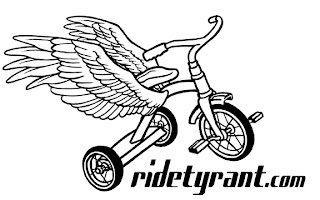 ...and don't forget to spread the word, new site in the works: RIDETYRANT.com. The guys out at Identity Tattoo are holding it down in the Midwest. TYRANT's spreading across the country like a virus thanks to Shawn. Hey kiddies...save your money, buy a plane ticket, and go get tattooed by the guys at Identity....tell them TYRANT sent you! 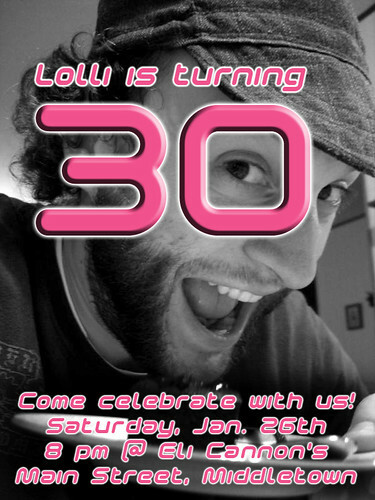 Our 5 year hosting contract is over and we're switching up the site. I've had tons of hits over the years and appreciate everyone checking out the site. 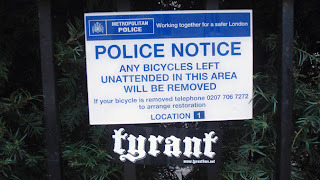 So T was overseas on business again and decided to spread some more TYRANT love, this time in London. I checked my site manager today and have had 6 hits from the UK in the past week. Pretty random, pretty cool! Last night's session at the Haven Skatepark was totally nuts! I witnessed some bodies getting hucked across huge gaps and people risking serious injury to pull some burly stuff. Check out the few photos I shot over at TYRANT's Photos. Keon...the 1st of 3 guys to pull this "bomb drop"